Jeffery Renard Allen’s habit of traveling to other countries for writing and teaching began in St. Petersburg, Russia about a dozen years ago. 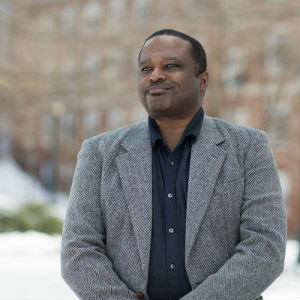 The newest professor in the University of Virginia’s well-known Creative Writing Program, Allen brings a wide international perspective on the writing life to the classroom. Allen is the author of three works of fiction: the acclaimed 2014 novel, “Song of the Shank,” nominated for the Dublin Literary Prize; the celebrated novel, “Rails Under My Back,” which won the Chicago Tribune’s 2000 Heartland Prize for Fiction; and a short story collection, “Holding Pattern.” He has also published two volumes of poetry, “Stellar Places” and “Harbors and Spirits,” plus a range of essays and reviews. A recent recipient of a Guggenheim fellowship, Allen has an essay about the “Black Lives Matter” movement that focuses on ordinary black people forthcoming in April in the Evergreen Review. Born in Chicago, Allen holds a Ph.D. in English-Creative Writing from the University of Illinois at Chicago, and for about 20 years taught at Queens College in New York and in the writing program at New York’s New School before joining UVA’s faculty. He will read from his latest work at the Virginia Festival of the Book event “Historic Fiction: Complex and Compelling” on March 17 at 10 a.m., at the central Jefferson-Madison Regional Library. Q. You moved from New York City. How do you like Charlottesville and UVA so far? A. Well, I’m a city kid. I grew up in Chicago, and then I lived in New York for 23 years or so. I had spent some time in the South as a kid, since my mom was originally from Mississippi. Then my grandmother lived in West Memphis, Arkansas, so I spent summers there, too. It’s been an adjustment, but I’m enjoying the different pace and the quiet, and the fact that I have much more space here in Charlottesville than I did in New York. I’m enjoying that I’m at a very good university with colleagues I like and great students. Q. What are you teaching this year? Q. What is the difference in looking at literature from a writer’s point of view? A. It’s really about trying to teach emerging writers how to read their way into the tradition, which is to say, finding out what kind of things interest you in terms of literature and as a way of trying to develop your own voice as a writer. There are obviously craft questions that one can look at – let’s say, how one constructs character or uses point of view. All of these questions try to make people more conscious about what they’re doing in their own writing. Q. When did you know you wanted to become a writer? A. I was always an avid reader, from the time I was 6 or 7 years old. Perhaps that’s because I was an only child, I’m not really sure. From quite an early age I also began to write things in imitation of what I was reading, or television shows I watched, or movies I saw. I was always naturally drawn to creating with language. I also received praise from my teachers for my writing. I didn’t have any conscious sense of literature. It was largely something I did for fun. Later, it became something else. In college I was introduced to literature and other texts I hadn’t been exposed to before. That was an awakening for me. I went to college in 1980, and there were very few professors back then who taught writers of color. I had one professor who always made a point of including African-American writers. Through his classes and a few other classes I took, I was introduced to black writers and writers of color, and I began to do a lot of reading on my own – not just African-American writers, but also Latin American writers, Caribbean writers and so on. I encourage people to write because first of all, they love to do it and have to do it for that reason. I also encourage them to have tough skin and to form connections that can help them in terms of the publishing process. The writing is one thing. The whole business of writing is something else. Q. Which writers have influenced you, or who are your favorite authors? A. It’s a hard question. I would say my favorite novel is Gabriel García Márquez’s “One Hundred Years of Solitude,” just because I like the way it delights in the whole storytelling process. I don’t think I write in that manner at all. There are certainly writers I go to time and again – [Anton] Chekov, [William] Faulkner, Mavis Gallant, Juan Rulfo, Toni Morrison, especially “Beloved,” and Edward P. Jones. That said, everything starts for me with Chekov and Faulkner. One of the books I discovered as an undergraduate that I continue to hold a lot of admiration for is Jean Toomer’s book, “Cane,” from the Harlem Renaissance. So that’s a book I’ve read and taught many times. I have great admiration for Richard Wright’s work – not everything, but certainly his books “Native Son” and “Black Boy” and his short stories, in part because Wright was from Mississippi, but also moved to Chicago and wrote important work set in Chicago, and I saw some affinities there in some of the things I was trying to do as a young writer. I discovered the work of John Edgar Wideman when I was an undergraduate and I’ve been reading his work for 30 years or more now. He’s also become a good friend and something of a mentor. I also think that my reading interests have changed since I became a teacher and worked with graduate student writers. So some of the works that influenced my first publications are not necessarily as important as some works I read later. For example, with my most recent novel, “Song of the Shank,” reading writers like W.G. Sebald, Roberto Bolaño, [Marcel] Proust – these are people I hadn’t read when I wrote my first novel, so those writers had their own kind of impact on my thinking and on my work. Q. How did you get the idea for “Song of the Shank”? A. It started back in the late ’90s. I had essentially finished my first novel and was thinking about what I might try to do in my next book. I was just kind of reading around, reading some things. I had heard about Oliver Sacks, so I was reading his book, “An Anthropologist on Mars,” that has case studies of neurological disorders. In one chapter he talks about an “autistic savant,” this Afro-British kid, Stephen Wiltshire [and mentions] Thomas Greene Wiggins, who performed under the stage name, “Blind Tom,” one of the first known historical examples of the autistic savant. So that’s how I first heard about his story – but that’s not completely true either, as these stories often are. I realized later that probably back in the ’80s I had heard about Blind Tom [who played piano] from reading a study of black music. Back then, there was nothing that held any interest for me about Blind Tom, but at the particular moment when I read Sacks’ book 10 years later, I saw all these things about Blind Tom’s life that were really appealing to me, raising questions about “What is genius? What is creativity?” And I’ve always been interested in writing about music. Just the fact that Blind Tom had this fascinating life, being the first African-American to play at the White House, and being this black person who was essentially forced to give concerts for the Confederate cause – with this fascinating, rich source of material, I knew I had to do a novel where he would be involved. Q. How do you get ideas or inspiration for stories and poems? A. That’s one of my challenges as a writer – it takes me a long time to get good ideas. With Oliver Sacks and Blind Tom, that was completely out of the blue. I think a writer has to be open to the world and to be interested and read widely. Keep your eyes open and listen. For me, it is like that bolt of lightning. Once I feel strongly about an idea, and I know that’s the right one, then I can actually write that particular thing. But I have a hard time getting started before that lightning bolt strikes me. Q. Talk about how you got interested in African writers and the first time you went there. A. It wasn’t something I deliberately sought out initially. It started from a friendship … In 2004, I was invited to teach in St. Petersburg, Russia for the summer literary seminar program, and when I was there I met a Kenyan writer who was also there to teach, Binyavanga Wainaina, and we became friends. The following year, he was also in Russia and he brought over a group of Kenyan writers. A year after that, I decided I would go to Kenya. That was my first trip to the African continent. My travels to Africa have shown me another way of life I never would’ve known. I plan to write a book – not a travel book, but stories that are based on things I observed there, along with stories people have told me. There’s this wide world out there. That’s one of the reasons why I’m often interested in international writers. I’m trying to get a sense of what other people are thinking about the world. For that reason I like to use a lot of writers from other countries in the courses I teach. A. I’m thinking mostly – not really writing, because I’ve been busy getting settled here, and had a new baby. Right now I am working on a short story that I hope to finish over spring break. Other stories will follow before I start a new novel this summer. From there I’m thinking of writing a book-length work of nonfiction. I feel the focus of this memoir will have my mother at the center. But I’m trying to think of how to bring all these things together in the same space – travel, Africa, my relationship with my mother, my relationship with my wife, her efforts to adjust to America and what that’s like for her, and being a father – so there are a lot of things swimming about.